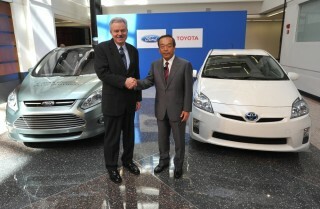 Ford and Toyota have each developed a pretty successful hybrid system. Now, the automakers are coming together to develop an even greater one. The vehicle manufacturers are teaming up to accelerate the availability of this new advanced hybrid system for light trucks and SUVs. By working together, the new systems will reach consumers faster and more economically than either company would be able to do alone. Following the collaboration, the automakers will each integrate the system into their vehicles on their own. Ford and Toyota will also work together to develop next-generation telematics systems that will make driving more convenient, safer, and more secure. Both automakers expressed optimism at the prospect of enhancing fuel efficiency and providing customers with the capabilities they want and need by teaming up. Ford is helping consumers combat the rising price of gas by increasing the availability of their low-rolling-resistant tires to more models. The fuel-saving tires can improve fuel economy by up to 2 mpg. Currently, the fuel-efficient tires are available on all four of Ford’s 40 mpg cars – the Ford Fiesta SFE, Focus SFE, Fusion Hybrid, and Lincoln MKZ Hybrid, as well as the 2011 Edge, Explorer, Fusion, and Taurus. Now, Ford will extend the availability to the upcoming C-MAX Energi, C-MAX Hybrid, and Focus Electric. The key to the tires’ fuel economy is low rolling resistance. Rolling resistance is a measure of the force that the tire requires to travel down the road. A 10% improvement in rolling resistance leads to a 2% improvement in fuel economy, according to Ford research. In addition to expanding the use of the automaker’s current fuel-efficient tires, Ford is also researching new tire material and searching for mroe ways to make tires even more economical. Jan D’Atri and Mike Broomhead from KFYI helped us out on Flag Day. Sanderson Ford was able to exchange 200 new flags for worn out ones. Our local Boy Scouts provided flag history, proper folding and handling, and a disposal ceremony for the tattered American flags.